You may have heard the quite surprising story of a US start-up company counting cars in US retailers’ parking lots to estimate the quarterly earnings of retailers before they get released. What’s even more remarkable is how automated this process has become. Part of the answer is orbiting 600 to 1000 km over our heads. What have been the enablers of such a revolution? Before answering that question, we’ll start with a brief review of the transformation of the satellite industry over the last 15 years. Satellites technologies used to be funded by governments to develop military and then civilian applications. A case in point that affects our daily life is the Global Positioning System (GPS), a Global Navigation Satellite System program that started in 1973, was fully operational in 1995, and opened to civilian applications in 2000. However, budget constraints and geopolitical changes have impacted the public space funding. For example, the USA went from dedicating 4,3 % of their federal budget to NASA in 1966, mainly driven by the Cold War, to 0,5 % in 2017. Standing in stark opposition of the public funding trends, we’ve recently witnessed rising interest from private investors to contribute to space technology development. 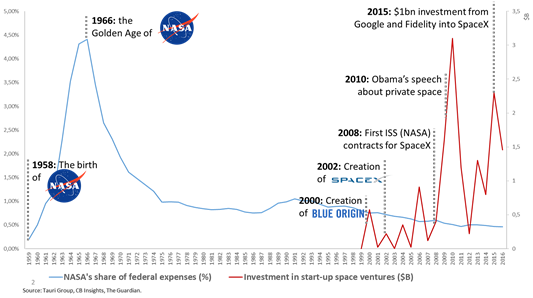 The amount investors have poured into private space startup companies has literally skyrocketed in the past 15 years. These investments have contributed (with the help of industrial space companies’ investments and public space agencies investments) to lower the cost of sending payloads into space by a factor of at least 4 in 25 years. An impressive number of satellite constellations emerged, providing new telecom networks (such as Astrocast, which is developing a global machine-to-machine communication network at an extremely low cost), new positioning systems, and new image sources (such as Planet, which recently announced that it now releases updated images of the whole surface of the globe once a day). New chips for devices have been developed to take advantage of multiple constellations and thus benefit from increased accuracy for positioning systems (such as Swift Navigation), for an extended coverage, lower cost or higher transmission speed for telecom applications. What can we expect from the rising number of imagery satellites? 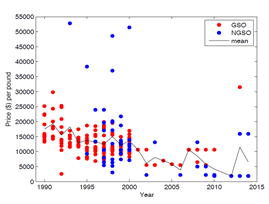 A rising number of satellites in space leads to a higher refresh frequency between two images. With a number of operative satellites that has been multiplied by 4 in 15 years, a daily refresh is not anymore something impossible, as proven by Planet. At last, the increased accuracy of sensors has been a key point in the improvement of image quality. As a result, high-quality and recent images are likely to become a commodity. If this prediction becomes a reality, what would prevent many industrial companies to take advantage of these new data sets? Getting affordable images is a first step. Analyzing them at a reasonable cost is another one. Highly skilled professionals called “photo analysts” have been doing this job for a long time, and are likely to continue to do it for highly confidential applications or where high levels of precision are required. However, improvements in the application of machine learning technologies such as supervised learning create a new paradigm by enabling the automatic analysis of large sets of images, particularly in repetitive use cases where the algorithms can infer the presence of labelled objects such as airplanes (see example above) based on prior training data. SpaceKnow is regularly analyzing 6000 industrial facilities China to create from scratch a China Satellite Manufacturing Index that many financial analysts have been chasing for years. Descartes Labs analyses thousands of acres of corn crops to predict US corn harvests. Earthcube detects abnormal events in pipeline areas to prevent fraud and accidents. And the list will continue to grow. Why couldn’t we use images to monitor the construction status of a highway to objectively quantify progress against a performance contract, now that we can get one image a day? Now that granularity is fine enough to detect roadworks (below 0.5m), why couldn’t we monitor changes in a road network via satellite instead of driving cars to maintain maps? 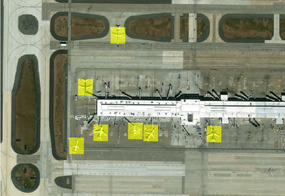 Why couldn’t we use satellite imagery to help auditors analyze an airline company by simultaneously counting airplanes at several airports worldwide, as shown in the picture above? At Aster, we’re passionate about the transformation of industrial sectors, and we’re actively exploring how satellites technologies will impact them. If you’re working on a startup project in this field, don’t hesitate to get in touch with our team! Belward A. 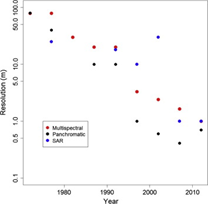 & Skoien J., Who launched what, when and why; trends in global land-cover observation capacity from civilian earth observation satellites, ISPRS Journal of Photogrammetry and Remote Sensing, April 2014.